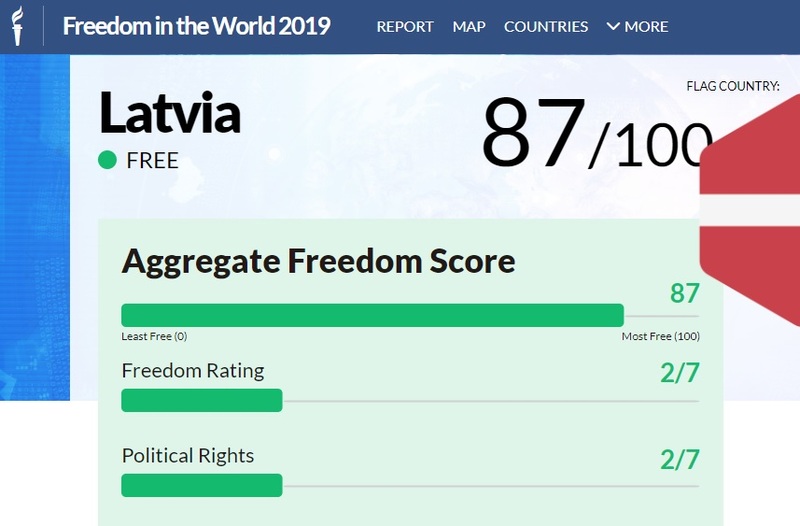 Latvia scores 87 points out of a possible 100 to be ranked as a "Free" nation according to Freedom in the World 2019, the latest edition of the annual country-by-country assessment of fundamental freedoms, released February 4 by Freedom House, a US-based independent watchdog organization dedicated to the expansion of freedom and democracy around the world. The score puts Latvia in joint 50th place worldwide. In doing so, Latvia scores better than fellow EU member states Poland (84 points), Romania (81), Bulgaria (80), Hungary (70), Croatia (85) and the same as Greece (87). Notably it also outperforms the United States, which scored 86 points. The highest-ranked country in the Americas is Canada (99 points). However, Baltic neighbors Estonia (94 points) and Lithuania (91) both score slightly better than Latvia, as do all other EU member states. Eastern neighbors Russia (20 points) and Belarus (19 points) are defined as "Not Free" while Ukraine (60 points) is "Partly Free". Since 2006, a total of 116 countries have seen a net decline, and only 63 have experienced a net improvement. Freedom in the World has recorded global declines in political rights and civil liberties for 13 consecutive years, from 2005 to 2018. The global average score has declined each year, and countries with net score declines have consistently outnumbered those with net improvements. Norway, Sweden and Finland are the top-ranked countries, all scoring a maximum 100 points. As part of this year’s report, Freedom House offered a special assessment of the state of democracy in the United States midway through the term of President Donald Trump. "While democracy in America remains robust by global standards, it has weakened significantly over the past eight years, and the current president’s ongoing attacks on the rule of law, fact-based journalism, and other principles and norms of democracy threaten further decline," the report said. The 2019 edition covers developments in 195 countries and 14 territories from January 1, 2018, through December 31, 2018. The report’s methodology is derived in large measure from the Universal Declaration of Human Rights, adopted by the UN General Assembly in 1948. The full report is available from the Freedom House website. Are you ready to vote in Latvia's local elections?